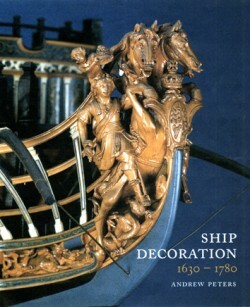 Following twelve years of research into the art of the ships carver, the book - Ship Decoration 1630-1750 - is a detailed comparative study of the decorative work - figurehead, topside ornamentation and stern gallery design - carried by the ships of the major maritime states of Europe in the zenith of the sailing ship era. It covers both warships and the most prestigious merchant ships, the East Indiamen of the chartered companies. The work began life in the year 2000 when Andy was commissioned to carry out research for an ambitious project to build a full-size replica of a Swedish East Indiaman. Although the book commences in 1630, it initially describes the artistic influences of each nation, charting their development from Renaissance and Mannerist styles into the emerging Baroque of Italy and France, before charting the gradual transformation of this major style, into the distinct national variations of France, Britain, the Netherlands, Denmark and Sweden, The book illustrates these developments which continue into Rococo and Neo-Classicism, with numerous photographs of contemporary ship models, paintings and plans, as well as the author’s own interpretive illustrations of details. Working as a professional ships carver, the author is able to approach the subject from a practical understanding and has included detailed accounts of the carved work for the French replica ship Hermione and the Swedish ship Gotheborg. As the first major work on the topic for nearly a century, it will be of obvious appeal to ship modelers and historians, but with comparative examples drawn from architecture and sculpture. It also makes a broader contribution to the history of the applied arts, highlighting little known links between eminent artists such as Anthony van Dyke, Jean Berain, Grinling Gibbons and their connection with the ornamentation of ships.